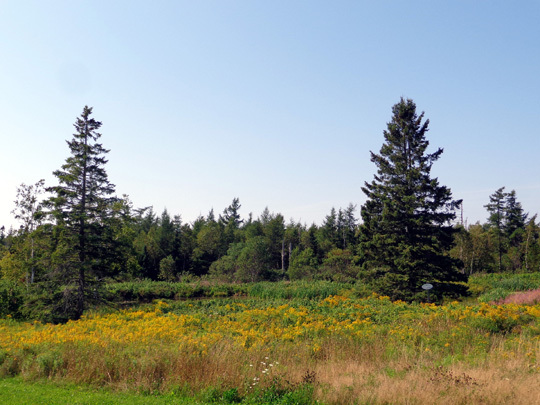 large comfortable lots while enjoying the beauty that PEI has to offer." 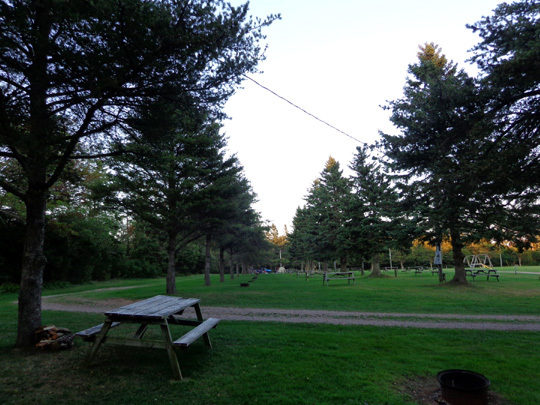 We made reservations for this campground several weeks ago while we were in New Hampshire and it was a good choice for a home base while we explored Prince Edward Island. 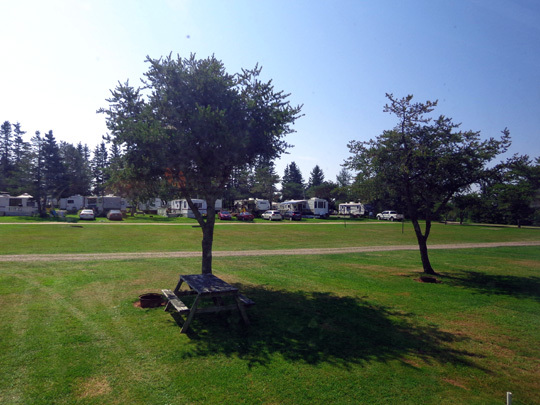 The campground is located about ten minutes NW of Charlottetown, the capital and largest city on PEI, and is conveniently located for many of the things we wanted to see and do. 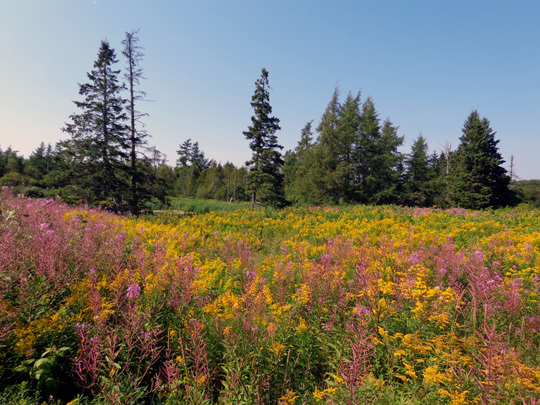 This is a large Good Sam park with over 200 sites on 41 acres. 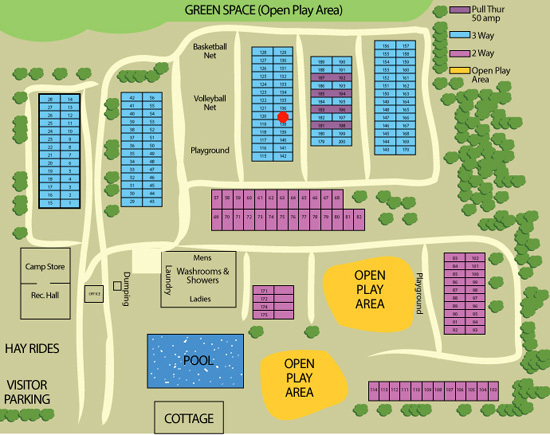 Here's a diagram from the campground's website. About 90 of the blue sites to the right and left are seasonal sites, where the RVs are often left all winter (unoccupied, I assume!). All the sites are on grass, which we like. 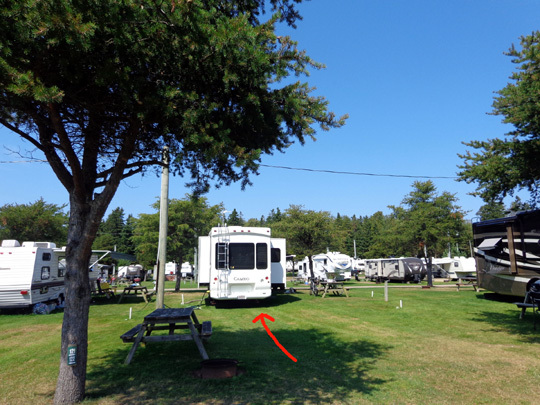 This is the second time in the Maritimes where we've had a nice grassy site -- under the camper, not just next to a gravel or concrete pad. 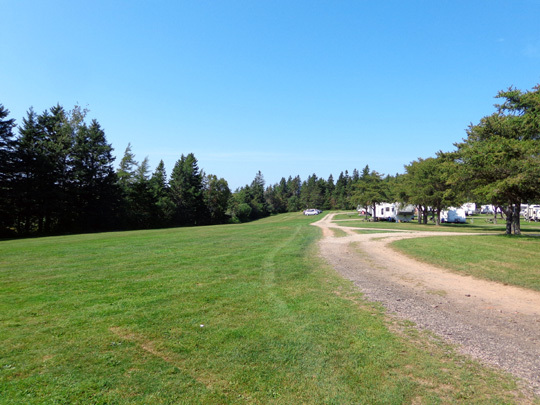 Even after some rain later in the week there weren't any puddles or mud near our camper. We have 30-amp electricity, water, sewer, and a decent WiFi signal. We can get three TV stations clearly with our camper antenna (no cable and we don't have a satellite dish). Our phone signal is iffy but we hardly ever use it anyway. Our door faces mostly east, and the bay window is south, so we get a lot of sun. Other amenities include a swimming pool, playgrounds, horseshoe pits, volleyball and basketball, and a game room. 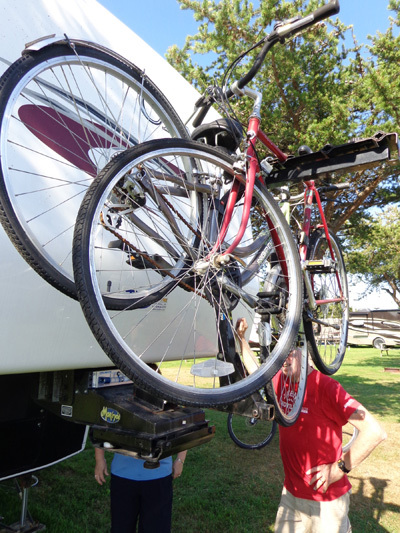 One cabin and several travel trailers are available to rent. 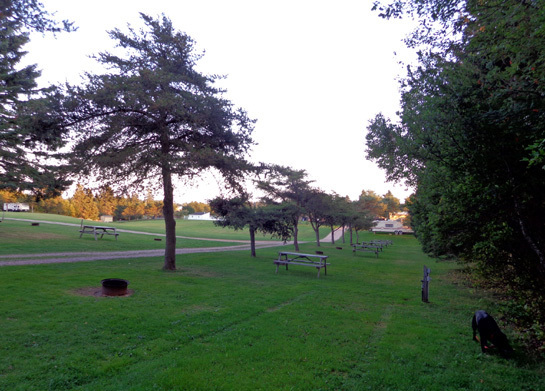 The campground is called Pine Hills for a reason -- lots of pine trees on the property and woods in the back. I don't know if all that land belongs to the campground owners but I didn't see any private property signs and no one ever ran me out. I'll show some more of the flower photos I took back there later in this entry. 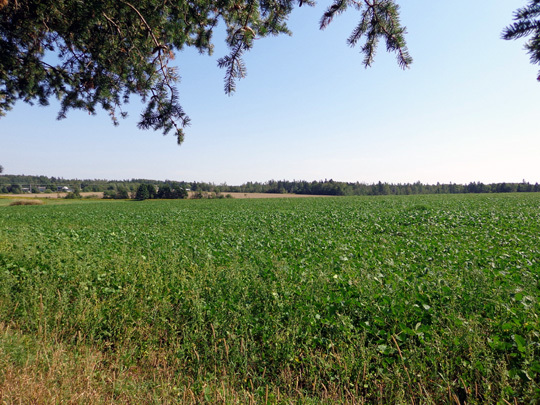 Potatoes are a major agricultural crop on the island. 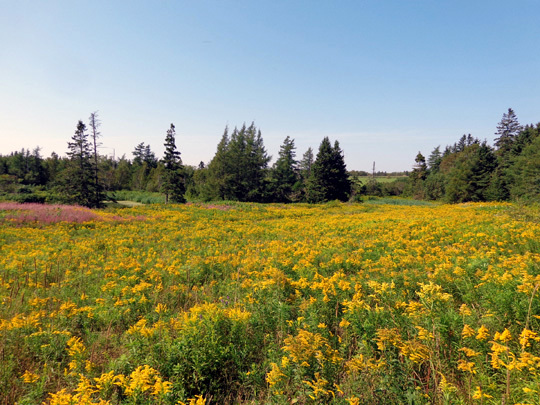 Someone in Nova Scotia we met was disappointed in PEI, saying all the potato fields make it look "just like Ohio." They expected something more exotic, I guess. They obviously didn't travel around the island enough! I've seen most of Ohio after living there for 25 years and I've seen most of PEI in one week. I think PEI wins the beauty contest. The terrain on the island is much more varied and interesting to me than Ohio. Half or more of the short-term full hook-up sites were empty the first three days we were here and no one was camped in the tent, partial hookup, or dry camping areas. 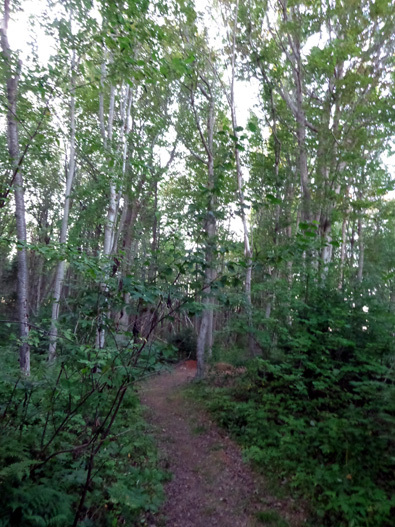 It was nice and quiet and we were able to walk the dogs all over the place. By Friday the whole place was full -- it was Labor Day weekend, which is celebrated in Canada at the same time as the U.S. Since all the spaces are pretty large I don't think anyone felt particularly crowded. All the tents and additional campers limited where I walked the dogs but we were gone a lot so it didn't matter much. What did matter was that three young couples from Nova Scotia who were in sites surrounding ours were noisy and inconsiderate (litter left behind, kids running amok, etc.). I was surprised. I had a better opinion of Nova Scotians than that. After all the weekend folks left it was peaceful again our last day and night in the campground. 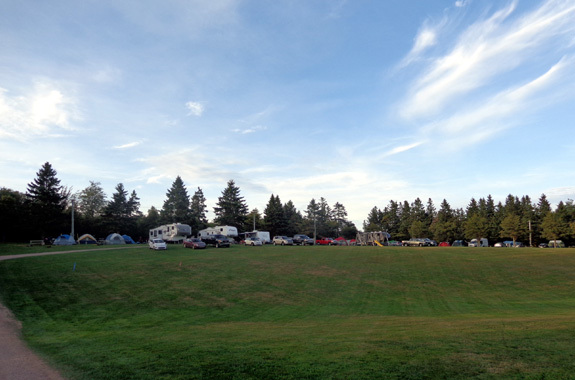 By far the majority of people we've met in campgrounds and other places in the Maritimes have been welcoming, helpful, and courteous. 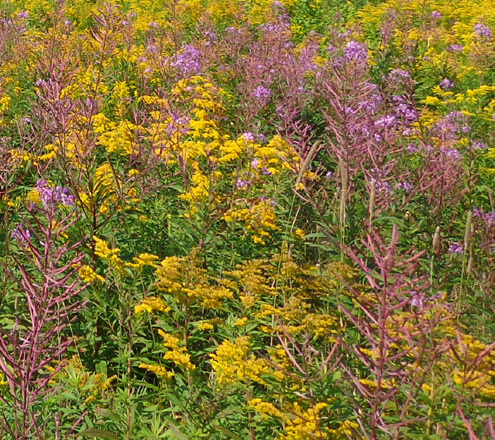 Autumn is fast approaching; the fireweeds are almost done blooming. One is a retired couple from British Columbia who travel most of the time but still have a house. They winter in Arizona and travel around Canada and the U.S. in warmer months. They have a 37-foot Tiffin Phaeton Class A. That would be our preferred brand if we ever get a motorhome. The couple toured the Tiffin plant in Alabama before ordering their coach, which is our plan before ever purchasing another RV (any type and either special-ordered or off a dealer's lot). While we were talking with them a 38-foot Cameo pulled in and parked a few sites down from us. We haven't seen very many Cameos up here. When it looked like they were pretty well set up we went over to talk to them. They used to live on PEI for ten years. Now they have a place in Ottawa. They invited us in to see their interior and we let them inside ours. They have a 2011 model with a different floor plan than our 2010 36-foot model. It was interesting to see that they have the same colors and woods we do -- cabinets, countertops, furniture, blinds, walls, wallpaper trim, upholstery. Their vinyl and carpeting area little different. They've done some "remodeling" on their coach, too -- new faucets, showerhead, towel rods, closets, and such. I took photos of their bicycle hitch, which they had custom-made to fit on the top of their pin box. 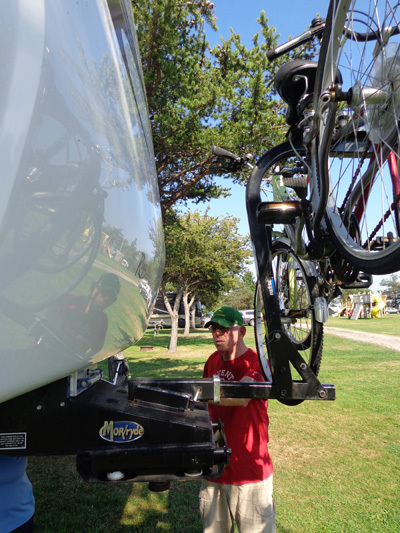 We haven't come up with a good solution for transporting our bikes other than keeping them inside in transit. We also met the guy across from us who has SD plates. His name sign says Brunswick, GA. He and his wife have a condo in GA but travel most of the time so they have SD residency and mailing service. They've been here about a week and gave us lots of information about things to do and see. We've talked to them several times. 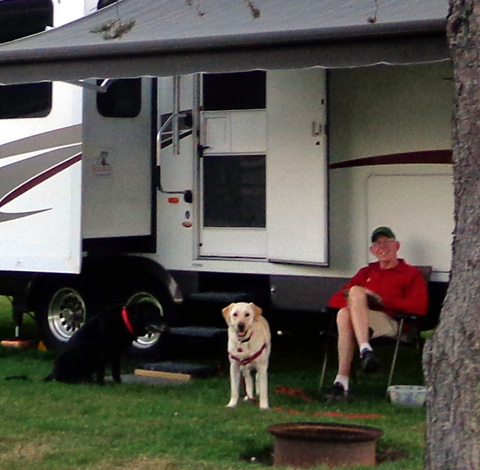 During our week at the campground we met other friendly, interesting folks from Canada and the U.S. 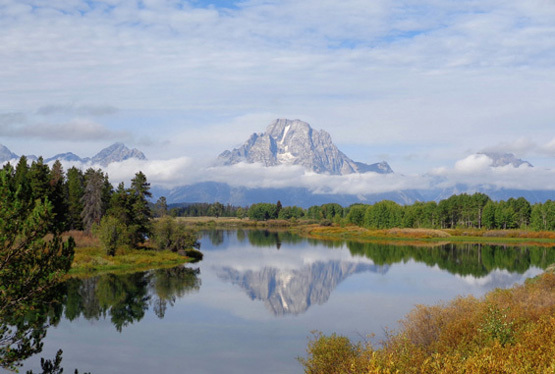 In addition to residents, other travelers are often a great source of information about local activities and attractions because they're seeing it with fresh eyes just like we are. We also learned about an interesting lifestyle choice when we talked with an older man who's here with his wife for the summer. It's their first time as seasonal campers and they love it. So do about ninety other folks/couples who have sites here. 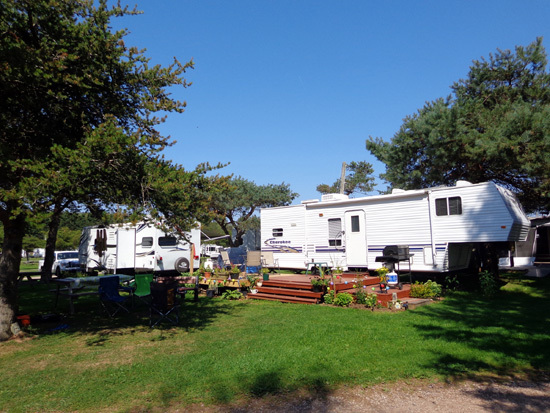 Seasonal campers at Pine Hills RV Park pay only $1,400 CA for four months from mid-May or early June to September. 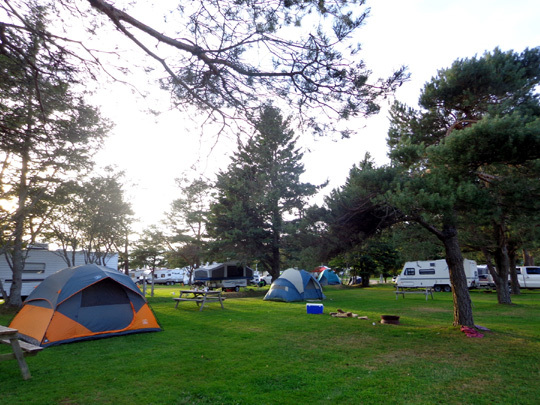 That price includes electricity; many RV parks in the U.S. charge seasonal residents separately for their individual electrical use. One of about 90 seasonal sites at Pine Hill; note the nice deck, flowers, etc. on this end lot. This couple has a house about 20 minutes away, which surprises us. 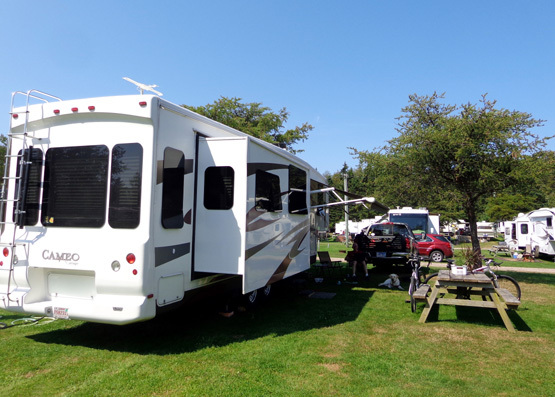 Why bother with a new 5th-wheel coach, the wooden deck he's building, and the campground fee if you have a house 20 minutes away??? We don't get it. 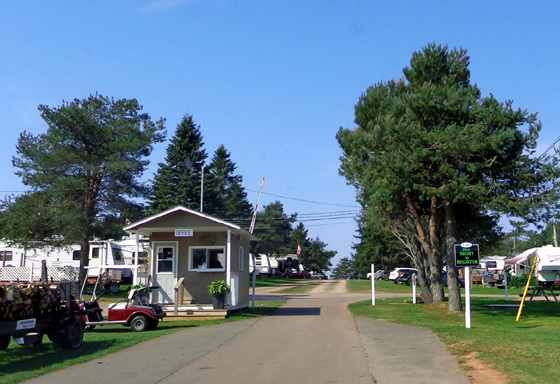 He says most of the seasonal people here have houses on the island, and most don't go south for the winter -- they just leave their RVs at the campground and move back to their stick houses when it gets cold. According to this man most of them are retired, not working and just here on the weekends. I don't fully get it. This is a nice place to relax and socialize but why pay for two homes so close together? The campground is not even on the water. 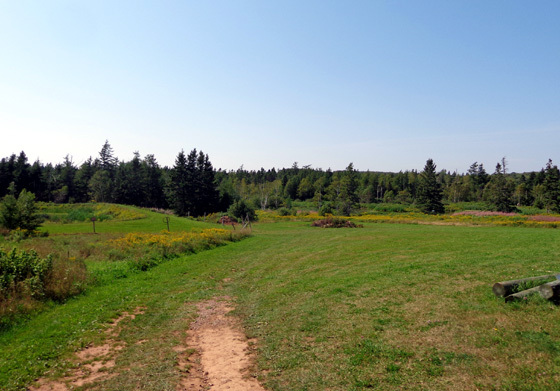 In fact, PEI is so small anyone is within half an hour or less of one of the coasts. 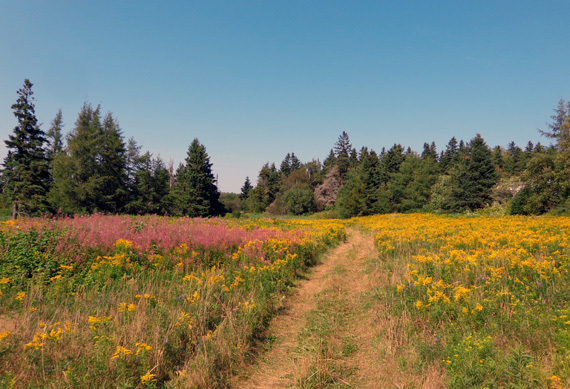 As visitors from elsewhere, we highly recommend staying at Pine Hills. 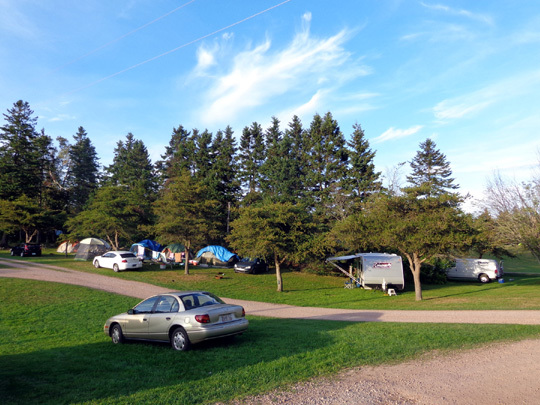 It was our favorite campground of the five where we stayed in the Maritimes.